A recent caricature as a present for a couple getting married in cork today! 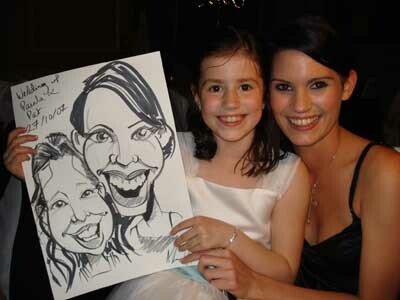 If you would like a caricature that your guests can sign, contact me here! Congratulations Carolyn and Denis! I was entertaining the guests of Josephine and Tommy in the Glendalough Hotel, Co. Wicklow on New Year’s Eve. Great craic! Some more caricatures from last weekend! More from the Temple Gate Hotel in Ennis last weekend. Had a local one in the Ardilaun Hotel, Taylor’s Hill in Galway on Saturday night at the wedding of Paula and Pat. Congratulations guys! If you would like my brand of wedding entertainment for your guests you can contact me here.